Annual NSW research awards program that celebrates excellence and innovation in cancer research. 2018 Premier's Awards were on Friday 2 November, Four Seasons, Sydney. 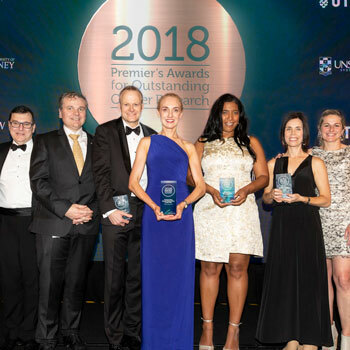 The 2018 Premier's Awards for Outstanding Cancer Research were held on 2 November at the Four Seasons, Sydney. Find out about the winners and discover their achievements in cancer research. Professor Georgina Long leads an extensive clinical trials team and laboratory at Melanoma Institute Australia, focusing on targeted therapies and immuno-oncology in melanoma. She is principal investigator on international clinical trials in adjuvant and metastatic melanoma – designing, writing and completing them across areas including immunotherapy in active brain metastases. Professor Long has published over 200 peer-reviewed papers since 2011. With her leading role in clinical and translational research, and in the management of melanoma, she is both a national and international leader. Professor Richard Scolyer is the world’s most highly cited melanoma pathologist (H-index 77), leading a world-renowned translational research laboratory at the University of Sydney. He has led ground-breaking work in the diagnosis and prognostic markers of melanoma, the genetic characterisation of melanoma, cancer staging, and the rapid detection of the BRAF mutation by immunohistochemistry. Together it has made a real difference to the management and survival of people with melanoma. His leading work on the classification of skin cancers and staging has had an impact across the world. The Australian Pancreatic Cancer Genome Initiative, formed in 2009, is improving treatment and diagnosis of people with pancreatic cancer. The team facilitates research projects which systematically catalogue the genomic and epigenomic abnormalities in pancreatic cancer, and translate discoveries into routine clinical care. The Initiative brings together surgeons, oncologists, radiologists, pathologists, palliative care physicians, nurses, psychologists, ethicists, basic scientists, tumour bank co-ordinators and patient advocates. The executive team are Professor Anthony Gill (Chairman), Ms Amber Johns, Professor Sean Grimmond, Dr Nic Waddell, A/Prof Nik Zeps, Dr Lorraine Chantrill, A/Prof Paul Timpson and Dr John Pearson. Bringing together researchers and clinicians onto a single site, The Kinghorn Cancer Centre fosters laboratory research directly driven by clinical challenges. The focus of clinical research at The Kinghorn Cancer Centre is in the areas of breast, prostate, gastrointestinal (pancreas and colorectal cancer) and haematological cancer. Associate Professor Anne Cust’s program of research focuses on innovative ways to prevent new cases of melanoma. She is investigating how genes and the environment interact to cause melanoma, as well as improving survivorship outcomes, and evaluating cancer prevention strategies and policies. She uses a multidisciplinary, collaborative approach, with a strong focus on the translation of research into clinical practice and policy. Her work is contributing to better identification of individuals at high risk of melanoma, more effective ways to prevent melanoma, and more effective and cost-effective clinical care. Associate Professor Alexander Menzies’ project is identifying biomarkers that accurately predict the benefit of current treatments for people with melanoma. It is also identifying new targets and treatments, tailoring treatments to individuals, and exploring the molecular profile of melanoma to identify factors driving disease progression. Since 2009 Associate Professor Menzies has been an investigator on over 80 sponsored and investigator-led Phase I to III clinical trials of systemic therapies in melanoma. In the last 5 years he has over 85 publications with more than 2000 citations in journals such as Nature, Lancet Oncology, Journal of Clinical Oncology and more. Dr Antoinette Catherine Anazodo’s PhD project is ‘Future Fertility – Reproductive Concerns of Cancer Patients’. Her work has resulted in the development of the first oncofertility registry providing ‘big data’ on uptake, utilisation, complication and success of oncofertility care. It has been instrumental in the development of Medicare item numbers for public funding for oncofertility care in Australia. She has also developed a comprehensive cancer service for young people across both the paediatric and adult cancer centre, as well as opportunities for research and clinical collaborations. Discover the 2017 Premier's Awards winners and learn about their outstanding achievements. See who took the honours in 2015 - the outstanding achievements of the individuals and teams that work across the cancer research sector to lessen the impact of cancer for the people of NSW.